On Saturday, February 23rd Free Arts Arizona hosted a conference for their mentors, partner agencies and teaching artists. The conference was titled “Art+Mentors= Resilience.” Our Executive Director and Programs Manager were lucky enough to make a weekend trip out of it. On Friday the 22nd they were able to meet the wonderful staff and mentors at Free Arts AZ, see their programs in action, and get a tour of their new facility. Then, on Saturday they attended the conference alongside committed partners and volunteers. The weekend served as an exciting reminder of why we do this work and where Free Arts LA wants to take it. They wanted to share our gratitude and reflections with our community here in LA as we all strengthen our commitment to expanding our programs and our potential. While Free Arts AZ does not have a court house program like Free Arts LA, they have a rich and expansive teaching artist program, mentor program, Free Arts Days, and summer camp programs. Their programs team balances so many moving pieces to bring meaningful art experiences to the children in their community who need it most. Our greatest teachers, evaluators, and role models should always be the children we serve. They show us what resilience and hope mean every day. The art is already there. In our mentors, our partner agencies, and our communities. We are always among amazing and talented painters, dancers, dramateurs, etc. we just have to make the space for full expression. Our work is deeply personal. Our staff, volunteers, and mentors should feel safe and empowered to share with each other and their mentors what brings them into this work and what restores their own resilience. Our work is deeply political. The children that we serve experience traumas that are not disconnected from the social and political climates that they live in. Advocating for these children also means addressing the violence of poverty, homelessness, racism, homophobia, and gender based violence. Relationships with partners, artists, and youth are everything! We are trying to teach children how to have healthy and sustained relationships with adults- we have to model this in our daily work. It is better to be an inch wide and a mile deep than a mile wide and an inch deep. Ensuring that the work we currently do is effective is more important than rapidly expanding and losing the quality work we pride ourselves in. Surely, there are more lessons to come- but we are eager to get back to our programs with newfound inspiration! Huge thank you to Free Arts AZ and everyone we met at the conference for welcoming our team with such warmth and for sharing your stories, passions, and excitement with us. Also a huge thank you to our LA community for your support as we work towards becoming the most compassionate and fierce mentors, artists, and advocates we can be. Check out our highlights from 2018! Imagine yourself in a courthouse waiting room- the air is full of uncertainty, confusion and the sharp smell of glue. Social workers and lawyers are interviewing their clients all around you, struggling to be heard over the bailiffs yelling case numbers and the cries of family members saying their goodbyes. In the middle of all this, you find a haven of art and creativity. Free Arts’ courthouse program serves over 20,000 children each year, helping them to find hope and strength in their journey ahead through art. One project, the Dream House, which asks children to think of what their dream house would be like - from the neighborhood it’s in, to the kind of furniture they’d like, to how many pools they’d want - stood out to a child named Kayla (age 7). “Kayla was always quiet and kept to herself. She didn’t seem to want to participate in the art activities in front of her. Being concerned, a Free Arts volunteer asked Kayla questions about her dream house, but Kayla didn’t answer. The volunteer continued to give Kayla genuine attention and care, asking her different questions to help Kayla imagine her dream house. Finally, Kayla said, “I’d want to have 9 kitchens.” Curious, the volunteer asked her why she’d need so many kitchens. Kayla began opening up more about her love of cooking, especially with her entire family when they can all be together. Kayla wanted to make sure that each member of her family had their own kitchen so they could cook a giant feast together every Sunday. 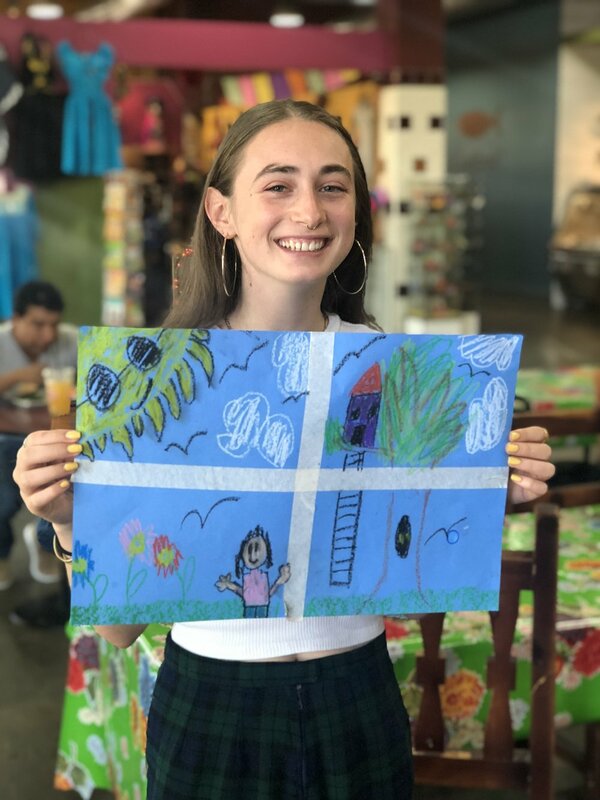 Please consider making a year-end gift so more children like Kayla can rediscover their voice and self worth through art. This year on #GivingTuesday, Free Arts is celebrating giving by thanking all those who support our mission and change children’s lives through art and mentorship across Los Angeles County. Join the #GivingTuesday movement by giving your time, voice, dollars, skills and/or goods! If you’re interested in donating, please visit our donation page. We’d first like to thank our donors for continuing to support Free Arts’ mission. Your continued generosity has kept Free Arts in the Los Angeles community for 41 years. Every donation counts, small or large, and we hope that you continue to support Free Arts as we grow and serve more children across Los Angeles. We’d also like to thank our wonderful board members, who donate their time, dollars and resources to Free Arts annually. They are our best ambassadors and partners, and we are so grateful to have each and every one of them! If you're interested in joining the Free Arts team, visit this page for more info. Finally, we’d like to thank our hundreds of volunteers who give their time to children in need of mentorship and art in Los Angeles. Your dedication brings life to Free Arts’ mission, and our programs continue to thrive because of your generosity! If you'd like to donate your time, visit our volunteer page for more info. In case you aren’t familiar, #GivingTuesday is a global day of giving that harnesses the collective power of individuals, communities and organizations to encourage philanthropy and to celebrate generosity worldwide. Following Thanksgiving and the widely recognized shopping events Black Friday and Cyber Monday, this year’s #GivingTuesday is on November 27th and will kick off the giving season by inspiring people to collaborate and give back. I believe that kids want to be kids; everyone wants to play, be creative, have fun with friends, but not everyone in LA is exposed to the same stressors that children in our partner facilities deal with daily. Hi everyone! I hope the summer has been good to you; it sure has been for me! My time here at Free Arts is quickly coming to a close and I thought it a good time to share some of my favorite experiences and reflections I have had over the season. I started at Free Arts on June 4 under the sponsorship of the Los Angeles County Arts Commission. LACAC has been advocating for the involvement of students in the art economy in Los Angeles, chiefly through non-profit work and development with the aims of bolstering the next generation of creative leaders. Their paid internship program has been instrumental in connecting students with amazing organizations, relevant full-time work experience and -wait for it- money! I truly appreciate the efforts of LACAC in Los Angeles County and can vouch on their impact through my experience at Free Arts. When I applied to the LACAC internship program, I was applying with the express interest in working with Free Arts. 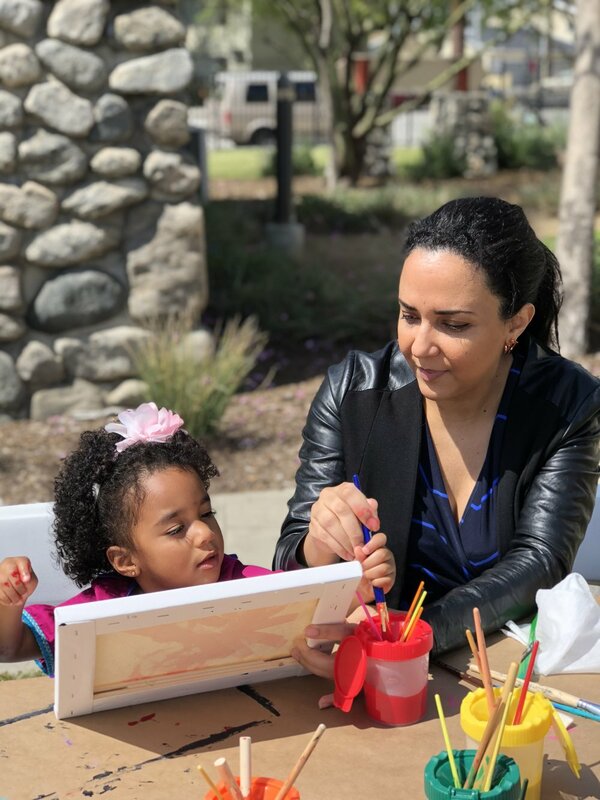 There are several factors that make Free Arts exciting for me: the opportunity to connect with children and young adults from my community in LA, work on creative art projects, and collaborate with a team who is just as excited to extend creative opportunities to the rest of LA. And lo and behold, my internship experience lived up to the hype! There are several projects that I was involved in that highlighted the nature of working with an arts non-profit: outreaching to facilities and potential partners, communicating with and training volunteers, creating curriculum for programs, and supporting Free Arts’ programs. Some of the most important experiences and lessons, however, came from the relationships I built with children in our 8-week-long off-site mentorship programs. There, I had the chance to sit down and talk with the students and be present to support their experience in art making and creativity. Through my interactions with children I was able to learn more about Los Angeles and support the education of at-risk youth. I believe that kids want to be kids; everyone wants to play, be creative, have fun with friends, but not everyone in LA is exposed to the same stressors that children in our partner facilities deal with daily. Without generalizing the experiences of everyone, I did see anxieties over gun violence, fighting, and poverty bubble-up through our conversations. However, by being present and involved, I was able to facilitate their creative experience and give them new tools to think with, or at the very least, be an adult that invariably supports them and challenges them to be the best they can. As Free Arts continues to grow and involve both more children and more quality volunteer mentors, I hope that more and more communities realize the importance of art education and more volunteers jump to action to support creative programming. I am super grateful that I was able to be part of the Free Arts team this summer and I look forward to seeing how I can still be involved in the future. Until then, I will be wrapping up my summer projects as I get ready to go back to school in Berkeley for my final year. Ciao! These smaller interactions [with children] evidenced to me the crucial role of artistic process for fostering confidence and community. During my time interning for Free Arts this summer, I have had the opportunity to move between development and programs. This meant focusing on fundraising data, events, and other administrative work Monday through Thursday, and ending each week at Slauson Multipurpose community center to assist with one of Free Arts’ mentorship programs. Having gone into this internship with little exposure to non-profit work, both of these roles offered respective challenges and ample learning opportunities. Working in development arguably entailed newer tasks– learning a database and becoming familiar with a higher level understanding of how a 501c3 operates. Nevertheless, I found my position as a development intern most rewarding when it overlapped with programs and other interfaces within the organization. Returning to Slauson every Friday for seven weeks, I was able to witness some of the transformations engendered by the mentorship program. One of the more observable tenets of this process was the shift in the kids enthusiasm and engagement with the projects. A couple weeks in, I noticed kids reiterating messages to one and other that we had initially presented. Whether this was how to be patient with a material, to keep making things in spite of proposed “mistakes”, or how to trace your silhouette from your shadow. These smaller interactions evidenced to me the crucial role of artistic process for fostering confidence and community. While we as volunteer mentors helped facilitate space for creative and personal exploration without stakes, hearing the members of Slauson continue to artistically encourage one and other on their own accord exemplified to me the lasting impact of this facilitation. My time assisting at Slauson and occasionally assisting the courthouse program gave faces and voices to the development work conducted behind the scenes. It was one thing to read Free Arts’ mission and understand it intellectually, and another to witness what it looked and felt like when it is realized in its diverse modalities. And I found in the day-to-day, that it is realized in smaller ways–both behind the scenes and in the field. 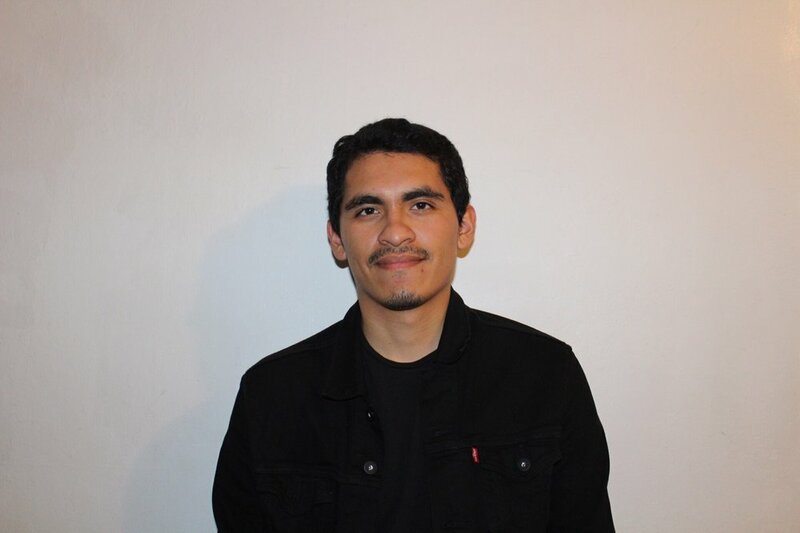 I am an incoming junior at Occidental College, with a double major in comparative studies in literature and culture and studio arts. Having been involved with arts my entire life–drawing, painting, printing, graphic design, and mixed-media–I have found its practices a primary conduit for navigating spaces and social issues. I believe creative exploration plays an integral role in personal and communal growth, and needs to be understood as such in the work of fostering a more equitable metropolitan environment. Disparity in access to education means disparity in access to artistic experimentation, however this latter tenet is often overlooked when treating the most immediate symptoms of education inequality. I hope to aid in transforming our understanding of creative experimentation from one of privilege to one of basic need. I was compelled to intern for Free Arts given the alignment of its mission with this incentive. As a comparative lit major, a lot of my academic work entails dissecting what is at stake for the human condition in our urge to produce and create, and importantly in the notion of play. The task of ensuring that these concerns transcend the boundaries of academia has inspired me to become acquainted with the mechanisms of the non-profit sector. I was specifically drawn to Free Arts, as I believe that this organization approaches human rights and resilience through one of its most fundamental but overlooked prism–recognition of the curative potential inscribed in arts and craftsmanship. In the past I have worked in curatorial, archival, and digital media roles for a gallery, arts collective, and production company, respectively dedicated to social justice and heritage protection. I have also been involved in tutoring and promoting higher education within Los Angeles’ public high schools. I hope to use my internship in development at Free Arts to learn the framework required for bridging these initiatives; including but not limited to gaining exposure to fundraising processes, becoming competent in a fundraising database, assisting third party events, understanding the collaborative relationship between development and programs, becoming versed in the necessities of a sustainable non-profit model, and occasionally participating hands-on with Free Arts’ programs. I aim to treat this internship both as a field-work opportunity for more deeply examining the goals of my academic career, and to explore possibilities of implementing my studies in ways that are constructive to Free Arts’ mission. In regards to what this might inspire for future endeavors, I hope to utilize this development role to expose myself to concrete and conscientious mechanisms for promoting inclusivity in spaces dedicated to artistic play and personal investigation. Check out everything Free Arts accomplished in 2016! Stay tuned for 2017 sometime next year! Each week for eight weeks Free Arts Program Leader Roshaunda works with two different groups of children for 90 minutes. Her goal is to help these children and teens re-discover hope and rebuild self-esteem and resiliency. Most of them live in foster care or are homeless and on their own. Nearly all deal with extreme poverty daily. “I love when I come in the room and everyone shouts ‘Hey, Miss Ro!’ The kids are so excited to find out what we’re going to do and they want to help set things up” said Roshaunda recently. Roshaunda said that at the beginning of the eight week program, a lot of children are intimidated, shy or don’t feel they can do much. Many struggle with anger and distrust of adults. It takes time to see positive change, but working with art helps them identify and cope with their feelings and daily life challenges. One example is a teen girl who didn’t want to sit with anybody at the beginning of the eight-week program, and she was aggressively making fun of others and picking on people. But after a few weeks, she became more calm because she saw that she was in a safe environment where she could be herself. She realized that she didn’t have to pick on anyone to make herself feel better. She could just feel good all by herself. Every child in the program comes with their own set of unique challenges. Roshaunda continuously adapts her mentoring and coaching to fit each group each child’s needs. One of the biggest challenges is to get children that don’t want to be there and who don’t trust adults, to trust the program leaders and mentors. Roshaunda works hard to gain children’s trust over time help them feel safe, so that they can participate in the art projects and reap the benefits. Based on what Roshaunda has observed and what children have told her, she knows that Free Arts has a positive effect on their lives. To learn more about Free Arts programs, click here! 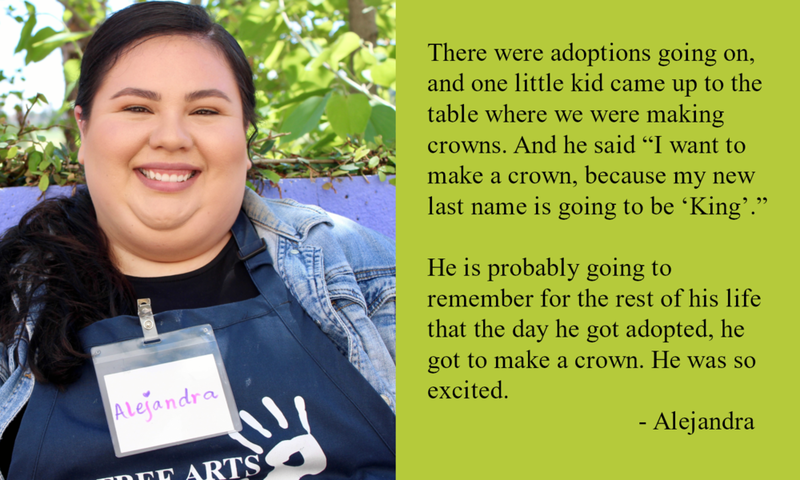 Free Arts’s mission is to restore hope, resiliency and self-esteem in children in Los Angeles through art projects. Free Arts pairs children with adult mentors who serve as a positive role model with whom the child has a beneficial relationship. What are the direct impacts of creating art? Art opens the door to self-reflection and self-expression. Learning to communicate through painting, drawing, writing, dancing or other arts offers a constructive method for children to share their identities with the outside world. When children learn new skills and engage in social activities, they become more self-confident. Learning social skills like cooperation and conflict resolution in a fun and relaxed environment will help them interact appropriately with others – a skill valuable in all aspects of life, from home to the workplace. Artistic programs can provide an outlet for creativity and problem-solving. Artistic activities encourage children’s natural curiosity and interests. Arts provide effective, engaging methods of emotional and physical stimulation, which encourages the overall creative thinking process. Free Arts staff and volunteer mentors use art techniques to create a bond with abused, neglected and homeless children. Through artistic activities, Free Arts helps restore hope, resiliency, and self-esteem in children in Los Angeles ages 5-18. For more information about Free Arts, click here! “I always loved doing arts and crafts with kids. I am not proficient enough to be an artist, but I do think that it’s a very cathartic process. Kids discover things about themselves when they’re doing art,” Kerrin said. Kerrin has been volunteering with Free Arts since October 2016. She is a professional stay-at-home mother and loves spending time with kids. When both of her daughters graduated high school, she was looking for new volunteer experiences. “I stumbled across Free Arts because I had been on jury duty a couple of years ago. I saw kids in the courthouse, and I thought that it must be horrible to have to come and sit in a courthouse while their parents are dealing with their case. So I tried to find an organization that would help kids in that situation, and that’s how I found Free Arts,” Kerrin said. She felt like the courthouse program was the best fit for her. She liked the idea of meeting a lot of different children at every session. 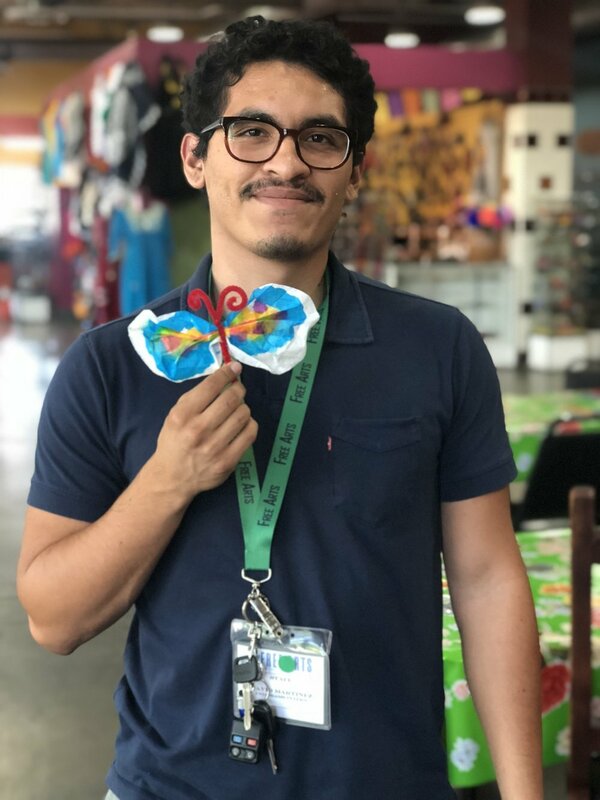 Every Monday morning, Kerrin goes to the Edmund D. Edelman Children’s Court and meets with Karol Hernandez, Free Arts Programs Manager, and other volunteer mentors to provide art activities for children waiting to testify in dependency court. The courthouse is a very stressful environment for children who have to sit around in the waiting rooms for their case to be called. Those children are bounced around between their family, their lawyers, and judges. Free Arts provides children with a safe and creative space in the courthouse and engages children in art activities that promote resiliency, self-esteem and hope. Free Arts volunteer mentors bring positivity and smiles to this stressful place. “Everyday, a child does something that I find clever or really thoughtful, and they get to be just kids at the table. When they are doing art they can chat about stuff, and it really keeps their mind off of the environment they are in, and they get to explore new things,” Kerrin said. “I never instruct the children about what the project is going to be, because they always end up having better ideas than I do. There is not a right or wrong at the table, we are just doing art,” she explained. Free Arts volunteer mentors set up tables in the courthouse waiting room, where children can create and express themselves. Children get to come and go from the tables as they are waiting for a case to be heard by a judge. “One of the challenges in the courthouse program is that you don’t have time to get to know the children very well, so it can be hard to see what they are gravitating towards. But with art, everything is easier. Art is a great way for kids to unlock, to see what they like,” Kerrin said. Kerrin, volunteer mentor at the Courthouse Program. “We were doing a project based on little paper people and children can add attributes to them. There were probably 4 children at the table, and when it was time to clean up, they wanted to put on a show with their people, and it was amazing. We made tickets and they went around to give out the tickets to people in the waiting room for their little show. They lined chairs up and crouched down behind the chairs, so that only their little people were showing, and they made them move and talk. These children didn’t know each other beforehand, and by just sitting at the table and working on their paper people and chatting, they came together. Volunteer mentors like Kerrin bring Free Arts mission to life. Every week day volunteer mentors are on three floors of the courthouse, serving over 20,000 children a year. If you’d like to become a volunteer mentor and serve at Free Arts courthouse program, please click here. — Karol Hernandez, Program Manager at Free Arts. Volunteer mentors are essential to Free Arts’ mission. Last year, more than 200 volunteer mentors donated 14,000 hours to help provide therapeutic art programs to children and families. Free Arts volunteer mentors are often students or everyday people looking to serve in their community. Free Arts partners with many colleges and universities throughout Los Angeles, such as the Cal State branches and Los Angeles City College. “Everybody can be a volunteer,” Karol says. The only requirements are passing a background check and attending trainings. Free Arts training process helps volunteer mentors learn to interact with children and create activities for them in a safe environment. “Our trainings include content on biases, diversity and stereotypes so that our volunteer mentors can effectively serve children from diverse backgrounds. We also cover mandated reporting, and other information required to mentor children who have experienced abuse, neglect or homelessness. We want to make sure that our volunteers are prepared to be non-judgmental as well as supportive to any participants in our programs, whether they are children, parents or guardians,” Karol says. New volunteers during a training session. For the mentorship program there is an additional training designed to guide volunteer mentors through classroom management and how to interact with children in an engaging and welcoming way. “We don’t send our volunteer mentors out unprepared. They first go to trainings, then shadow a volunteer to see how it is firsthand. The courthouse is a particularly challenging environment and it can be intimidating at first, so we make sure our volunteer mentors feel comfortable at all times,” Karol says. 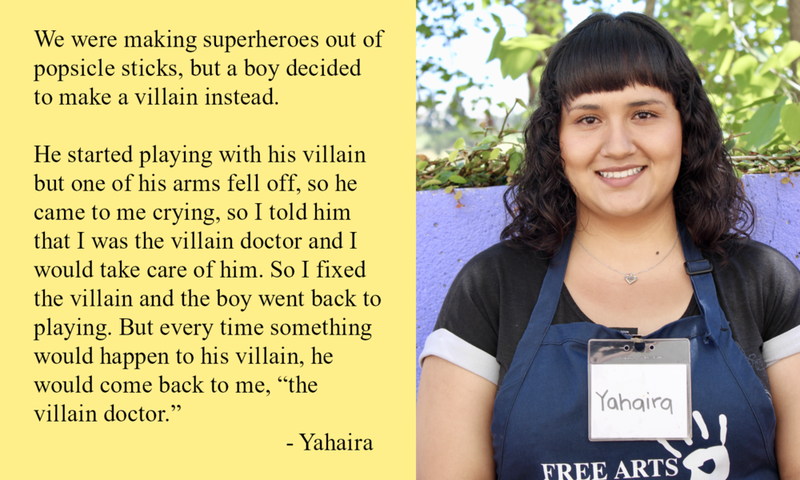 Free Arts believes every volunteer mentor has a unique gift and strength they can share to inspire hope in the lives of children. ● Be involved and show you care! ● Be flexible and adapt to every age group. ● Ask questions to break the ice. ● Bring warm and positive energy to the activities. “Some children can be shy or scared, so we are looking for volunteer mentors that can put effort into those shy children and bring them out of their box. When I see a shy child, I sit next to them and ask simple questions about their interests, like a TV show or activities that they like,” Karol says. Finding common ground with children is essential to creating a comfortable and creative environment. The goal is to show children that it is possible to build a healthy relationship with adults, and that there are people who care about them and will listen to their needs and interests.